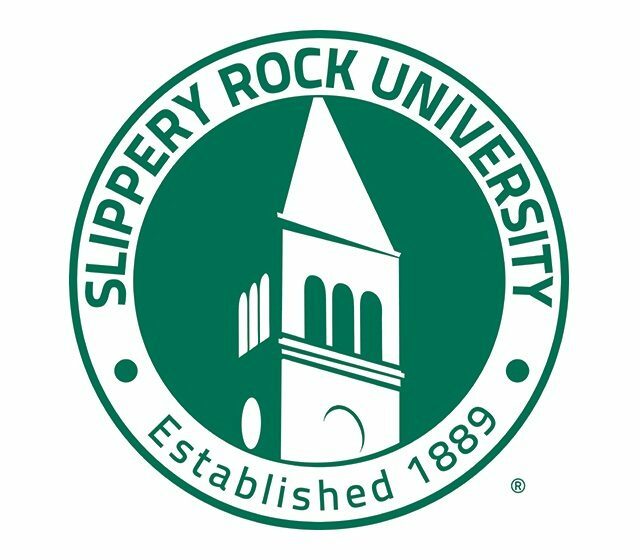 Slippery Rock University of Pennsylvania (also known as The Rock or SRU) is a public, master’s-level university that offers some doctoral programs. SRU is a member of the Pennsylvania State System of Higher Education (PASSHE). Slippery Rock University is located in Slippery Rock, in the U.S. state of Pennsylvania, approximately 52 miles (84 km) north of Pittsburgh and approximately 80 miles (130 km) south of Erie. The university has been coeducational since its founding in 1889. It has one of the largest campuses in western Pennsylvania, occupying 611 acres (2.4 km²). It includes new residential suites. Slippery Rock University of Pennsylvania competes in the NCAA Division II and is a member of the Pennsylvania State Athletic Conference (PSAC). Slippery Rock’s unofficial mascot is Rocky — The Pride of The Rock. Technically the university has no official mascot. “Rocky” and “Rock Pride” are initiatives of the Student Government Association and the Department of Athletics. Men’s teams: Baseball, Basketball, Cross Country, Football, Soccer, Indoor Track & Field, Outdoor Track & Field, and Bowling. Women’s teams: Basketball, Cross Country, Field Hockey, Soccer, Softball, Indoor Track & Field, Outdoor Track & Field, Volleyball, Lacrosse, and Tennis. In 2006, the university cut men’s and women’s swimming, men’s and women’s water polo, men’s Division I wrestling, men’s golf, and others. The announcement of Slippery Rock’s football scores is a tradition at University of Michigan Football games, begun in 1959 by Michigan Stadium’s public address announcer Steve Filipiak. Slippery Rock was so popular with U of M fans that on Sept. 29, 1979, they played in-state rival Shippensburg at Michigan Stadium, in front of 61,143 fans, a record for a Division II football game (Shippensburg won, 45-14). Slippery Rock played a second game at “The Big House” in 1981, attracting 36,719 fans in a 14-13 loss to Wayne State University. Slippery Rock made a third trip to “The Big House” on October 18, 2014, losing to Mercyhurst University, 45-23; a crowd of 15,121 braved a chilly wind to witness the contest. In 1995, the women’s water polo team won the intercollegiate national championship conducted by USA Water Polo. This remains the only collegiate water polo championship ever won by a non-California team. In 1987, the women’s judo team, a varsity sport team at the time, won the intercollegiate national championship conducted by the National Collegiate Judo Association. In 2006, the men’s lacrosse team won the Midwest Conference Championship and made it to the NCLL Final Four. The team won the Midwest Conference Championship again in 2007 but were defeated in the NCLL Sweet 16. In 2008 and 2009, the women’s rugby team won the Midwest Championship for the first time in school history. This led them to Nationals for two consecutive seasons in addition to making the Elite 8 both of those years. In 2010, the women’s ice hockey club won the DVCHC championship. This was the first time for the team and was achieved in the club’s third year in the playoffs. They also won back-to-back Crabpot Championships in 2010 and 2011. The women’s team finished 4th in the nation in 2012. In 2010 and 2011, the men’s ice hockey team won the CHMA regular season championship. Stanley Joseph Dziedzic, Jr. (’72) – American wrestler who earned a bronze medal at the 1976 Summer Olympics. Distinguished member of the National Wrestling Hall of Fame. Sarah Patterson – Head Coach, University of Alabama Gymnastics team, winner of five national championships, six SEC championships. Royce Waltman – former Head Coach, Men’s Basketball; Indiana State University, Univ. of Indianapolis and DePauw University. Brandon Fusco – drafted by the Minnesota Vikings in the 6th round of the 2011 NFL Draft. Played center while at Slippery Rock.